August 22, 2017 (Mount Laguna) — Many of you may know the Shriners as the clowns in fez hats driving miniature cars to delight crowds at the Mother Goose Parade each year. But they also own hospitals across the nation dedicated to treating children. July 9, 2014 (San Diego) –East County Magazine picked up 10 journalism awards tonight in the Society of Professional Journalists San Diego contest, including four first place awards and for the third year in a row, the James Julian Memorial Award for community reporting. ECM picked up two awards for reports aired on KNSJ radio, as well as honors for online reporting. This brings ECM’s total awards to 69 since our launch in 2008. “This is public service journalism at its finest—identify the problem for readers and track the changes. It worked in this case. Bravo,” commented a judge for the James Julian award, which includes a $100 cash prize for our story titled Why is County Veterans Service Department ignoring rural East County vets? By Miriam Raftery. After the report aired, Supervisor Dianne Jacob introduced a measure later adopted to bring veterans’ services to county libraries in rural locations. May 9, 2014 (Mount Laguna) -- CAL FIRE investigators have determined that the July 6, 2013 Chariot Fire southwest of Julian was caused by a Jeep Wrangler owned and operated by the Bureau of Land Management (BLM), which ignited the dry vegetation under the vehicle. The CAL FIRE finding confirms allegations previously made by an attorney representing fire victims, who had indicated a private investigation had revealed evidence that a BLM Jeep started the blaze. The Chariot Fire started just before 1 p.m. in eastern San Diego County near Butterfield Ranch Resort and the Great Southern Overland Stage Route on land managed by the BLM. The fire burned 7,055 acres on both federal and public lands and destroyed 149 structures, including a historic lodge, cabins at the Shrine Camp, and others. Over 2,100 firefighters battled the fire during the 10 days it took to contain the blaze. April 26, 2014 (Mount Laguna) – Cal Fire and the federal government have not released reports on the official cause of the Chariot Fire, which scorched over 7,000 acres and destroyed more than 100 buildings including a historic lodge and the century-old Al Bahr Shrine Camp. Now attorney John Fiske, who represents fire victims, says he has filed a claim against the U.S. Bureau of Land Management. August 28, 2013 (San Diego's East County) -- A flash flood warning is in effect until 4:15 p.m. for east central San Diego County. Heavy rain and thunderstorms are occurring in and around the Chariot Fire burn area. Doppler radar estimates up to 0.6 inches of rain has fallen in the burn area in about 30 minutes this afternoon. This is well in excess of U.S. G.S. thresholds for debris flows from this burn scar. Roads, trails and campgrounds located along drainages within or below the burned basins can be impacted by flash floods and debris flows. This includes areas along Highway S-2 and the great Southern Overland Stage route as wel as the Butterfield Ranch area. July 24, 2013 (Mount Laguna) – County Assessor/Recorder/Clerk Ernest Dronenburg is advising all property owners whose property was damaged or destroyed during the recent Chariot Fire that property tax relief is available. This tax relief program requires the reassessment of the property to reflect its damaged condition. The reduced value will remain in effect until such time as the property is rebuilt or repaired. More importantly, after the property is rebuilt or repaired, the owners can retain their previous taxable value if the property is rebuilt in a like or similar manner. This means that the property tax assessment will not increase beyond what it was prior to the fire. On Friday, August 9, the Rising from the Ashes fundraiser will be held to cover cleanup costs of the Shrine Camp on Mount Laguna, which was devastated by the Chariot Fire. The Al Bahr Shrine Center in San Diego will host the event from 5 to 11 p.m. in the Red Fez Room at the Al Bahr Shrine Center, 5440 Kearny Mesa Road in San Diego. The event, which costs $20 will include dinner and entertainment. The camp lost 23 buildings to the fire, including the Shriners’ 99-year-old lodge. July 12, 2013 (San Diego’s East County)--Damage assessment teams are combing through the charred remains today of the Al Bahr Shrine Campground area off Sunrise Highway in Mt. Laguna. CAL FIRE estimates 149 structures were damaged or destroyed when the Chariot Fire suddenly surged forward on Monday. The fire is now 98% contained, after charring 7,055 acres. The County encourages any residents who sustained losses in the Chariot Fire to visit www.sdcountyemergency.com for general recovery information. A Chariot Fire resources link is available here. An important tip for residents returning to fire-damaged properties is to contact your insurance carrier before beginning clean-up efforts and consider using a professional contractor to avoid any potential hazards. July 11, 2013 (Mount Laguna) -- Mandatory evacuations for all areas south of Los Huecos Road were lifted today as of 6:00 p.m., with the Chariot Fire now 65 percent contained. 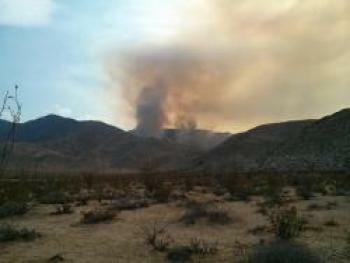 Evacuation orders remain in effect on Los Huecos Road and North to Kwaaymii Point. The wildfire has charred 7,055 acres, Cal Fire estimates, causing seven injuries. Full containment is projected for July 14. July 9, 2013 (Mt. Laguna)— For owners of property on Mount Laguna, the past 24-hours have been heart-wrenching. The Chariot Fire has reportedly destroyed 108 structures along Sunrise Highway, including the Al Bahr Shrine Camp and one lost at the Sierra Club Guymon Lodge. The blaze has scorched over 7,055 acres and is now 40 percent contained. Highway 79 is open but Sunrise Highway remains closed from 79 to I-8. Peering through thick smoke late yesterday at the Shrine Camp site (photo, left), we saw a husk of burnt metal and the charred remains of other structures. We later learned that losses included the 87-year-old lodge and a dozen or more cabins. July 9, 2013 (San Diego's East County) -- Our readers have sent some dramatic images of the Chariot Fire, which as of tonight has scorched 4,850 acres and burned at least eight buildings. Jim Pelley shot the photo, left, taken at sunset in Ocotillo. Update July 8, 2013 -- 9 p.m.: The fire, now 4,850 acres and 15% contained, has jumped across Surnise Highway. ECM has confirmation from multiple sources including an eyewitness report from our reporter Nadin Abbott at the scene that a structure has burned at Sierra Lodge and that Shrine Camp has also burned. Mt. Laguna is evacuated along the entire Sunrise Highway and an evacuation center, closed earlier, is now reopen at Joan McQueen Middle School, 2001 Tavern Road in Alpine. Dark smoke is billowing over the mountains at Descanso and Pine Valley; residents across these areas and Cuyamaca are advised to stay alert and informed. July 7, 2013 (Mt Laguna)—Crews from all over Southern California, including Kern, Orange, Los Angeles and San Diego County are fighting the Chariot fire. This fire is now at 2500 acres and 20% contained. Update 4:30 p.m. -- The fire is now 2,500 acres. An evacuation center is now open at Joan McQueen Middle School, 2001 Tavern Road in Alpine. The fire is now just one mile from communication towers on Monument Peak, including the new KNSJ 89.1 FM station's transmitter. Update 12:30 p.m. -- Pine Hills Cafe and Tavern has sent an email advising that there are now mandatory evacuations for the following sites: Shrine Camp, Laguna/ElPrado Campgrounds, & Horse Heaven Campground, and for two private properties. The town is not evacuated, however, at this time and the cafe remains open for business. 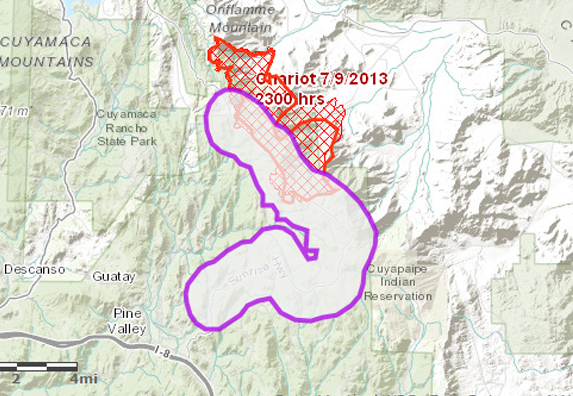 July 7, 2013 (San Diego's East County) -- The Chariot Fire, which began yesterday near the Butterfield Ranch, is now 1,700 acres, according to estimates by air attack pilots. Cal Fire officially lists the fire size at 1400 acres as of 8:45 a.m. The fire is still only 10 percent contained and could burn for days, scanner traffic indicates. The fire is burning nine miles southeast of Julian. Sunrise Highway on Mount Laguna reopened briefly after yesterday's shut down, but a hard closure has again been ordered from Highway 79 to Pine Valley. Voluntary evacuations of cabins and the Shriners campground have occurred as the fire burned into the canyon below the campground. A structure protection team has been assembled. The fire is now under joint command of the U.S. Forest Service and Cal-Fire as it burns into Cleveland National Forest. Firefighters have been contending with shifting winds and some have been treated for heat exhaustion.